Sam Hancock continued his successful relationship with the Goodwood circuit by claiming another podium finish in Sunday's Sussex Trophy. Hancock, a multiple winner at Goodwood, joined a grid of open top sports racing cars from the 1950's with the Ecurie Ecosse Lister Knobbly he used to claim victory earlier this year at the 73rd Members Meeting. Against tougher competition this weekend, the Knobbly lined up on the second row of the grid after Friday's qualifying. Racing into the sunset in front of a record 149,000 spectators, the pack rounded off a spectacular Revival weekend with thrilling action from start to finish. After a slow start which dropped him to fifth, Hancock quickly dispensed of Andy Newall's Aston Martin DBR2 and set after Nick Mason's Maserati Birdcage driven my Marino Franchitti. The lighter Birdcage proving more nimble in the corners, but less powerful on the straights, the contemporary sportscar racers fought tooth and nail throughout the opening laps until Hancock nipped by on the tricky run to "No Name" bend. Never one to give up, Franchitti continued to fill Hancock's mirrors and on more than one occasion the two were door handle to door handle with just centimetres separating them. Finally as they lapped slower traffic, Hancock put a gap between himself and the plucky Scottsman which he maintained to the flag to secure his place on the podium in 3rd position. "A little more hairy than I'd have liked!" claimed Hancock after the race. "A lot of fun but the car was extremely oversteery and with Marino pushing me so hard I didn't have a chance to let up on the tyres. By the end of the race the rears were feeling particularly sorry for themselves so I really had to hang on to the back end. I hope it gave the spectators something to watch! Thanks again to Sam Thomas Racing for preparing the car so reliably, its owner for entrusting it to me again, and to Lord March for yet another extraordinary weekend. I just feel so, so lucky to be a part of the incredible event every year. Just 364 days to go until the next one.."
Sam Hancock wins the Salvadori Cup in a Lister Knobbly prepared by Sam Thomas Racing (image: Drew Gibson). British racing driver, Sam Hancock, opened his 2015 account account with a perfect score from the 73rd Members Meeting at Goodwood, taking pole position, race victory and fastest lap in the Salvadori Cup. Driving the Ecurie Ecosse Lister Knobbly for Sam Thomas Racing, Hancock made his intentions clear by setting a pole position time over a second faster than his nearest rival. A strong race start and quick opening laps created a cushion that suggested an equally dominant win was inevitable. Drama ensued however when Hancock, first to arrive on the scene of a D-Type engine failure at half distance, hit oil on the apex of the super-fast 'No Name' corner, sending him onto the grass and into the tyre wall with ample force. Fortunately he was able to minimise damage by hitting side-on and with the steering wheel straight, allowing the car to ricochet back on the circuit with only bodywork damage and minor steering realignment. Unbelievably he retained the lead, such was the gap over hard charging Shaun Lynn in his second placed Lister; but while Hancock assessed the damage to his car, Lynn fired his opening salvos which made for a tense few corners and set up a spectacular battle that would rage to the flag. Crossing the line with a winning margin of just 0.589secs, Hancock was grateful for the strength of his steed. Sam Hancock departed this year's Goodwood Revival Meeting with more silverware to add to his collection, but not from the Sussex Trophy race that was originally anticipated to be his only event. Qualifying 4th but finishing 8th in the Friday night enduro shared with his brother Ollie after a tough race in the Lister Knobbly, 34-year old Hancock was then called up at the last minute to drive Ben Shuckburgh's 1953 Cunningham C4R in the Freddie March Memorial Trophy. Promptly setting his second consecutive pole position for the race, Hancock repeated his effort from last year in Stefan Ziegler's Ecurie Ecosse Jaguar C-Type. That he had never set foot in the Cunningham before added to the satisfaction, but with a margin of less that a tenth of a second over Darren McWhirter's Lagonda V12 Le Mans, he knew to expect a tough race. Maintaining the lead into the first corner, battle duly commenced between Hancock and four-time winner McWhirter. Defending hard and wrestling the visibly recalcitrant Cunningham around the 2.3 mile circuit, the sell out crowds were treated to a classic duel as McWhirter gave chase. Sneaking through on lap 5, the Lagonda was gifted a helpful cushion as Hancock was baulked while passing a back marker. With the gap soon stabilised, the Londoner set about reeling in McWhirter over the remaining minutes, in the process setting a personal best lap time 1.5s faster than his pole time, but just a tenth shy of the Lagonda's overall fastest lap of the race. After seventeen laps, the chequered flag fell in McWhirter's favour, Hancock crossing the line 2.9secs adrift in the 'Private White V.C.' emblazoned Cunningham. Still beaming, Hancock had clearly enjoy himself, "What a car! It's both beauty and beast - the engine and chassis are superb, the brakes ok, but the steering terrible! The original design creates so much free play that placing the car accurately on the track - let alone alongside another car in the heat of battle - is nearly impossible. But the challenge is hilarious and I found myself shouting, laughing, and despairing in equal measure throughout the race. It's like taming a raging bull but great fun for it. I'd like to think that we're friends now and that putting her on pole and finishing second shows the world what a fabulous and under rated car this is. I'm extremely grateful to my great friend Ben for the invitation, and to Kim and Mark for preparing her so well." "I also want to thank Sam Thomas Racing for having Ollie and I in the Lister and improving it considerably since the last time out. We ran out of time to fine tune it for this race, but it's a big step forward and I can't wait to get her dialled in so we can join the battle at the front of the pack." "Finally, and most importantly, my biggest thanks go to Lord March, his amazing staff and all of the marshals and helpers who once again put on another spectacular event. It amazes me how they do it year after year. We are just so lucky to be invited, it's become the highlight of my year." British racing driver Sam Hancock will contest the world renowned Goodwood Revival this weekend with a particularly special Lister-Jaguar Knobbly. The former Le Mans Series champion and experienced historic racer has once again been entrusted with the ex-Ecurie Ecosse BHL104 chassis that won the 1958 Spa 1000km in the hands of Masten Gregory. Sporting its period dark blue and white colour scheme, the Lister-Jaguar will line up against many of its contemporaries on Friday evening for the one-hour, two-driver Sussex Trophy race featuring world championship sports racing cars that competed in 1955-60. While Hancock is no stranger to the Sam Thomas Racing-prepared machine having taken it to a fourth place finish as part of Goodwood’s 72nd Members’ Meeting earlier this year, his brother Ollie – the 2008 Formula Renault BARC champion with whom he will share driving duties – has yet to turn a wheel in it. Nevertheless, a recent rebuild means Sam is optimistic of a strong result in one of the Revival’s showpiece events. Sam Hancock: “I am so excited to be heading back to the Goodwood Revival, especially as it involves co-driving with my brother,” he explained. “We’ve only done that once before and it was way back in 2007, so it’ll be a great experience I’m sure. “The Sussex Trophy entry list looks to be of a very high calibre and I’m fully expecting a fantastic race. The car performed reasonably well last time out at the Goodwood 72nd Members’ Meeting but lacked a little pace compared to the other front-runners. I know that Sam Thomas and his team have been working hard since then, and although I haven’t had a chance to test the car again I’m still hoping we can do it justice by bringing home a good result. The one-hour Sussex Trophy race begins at 18:30 on Friday evening. 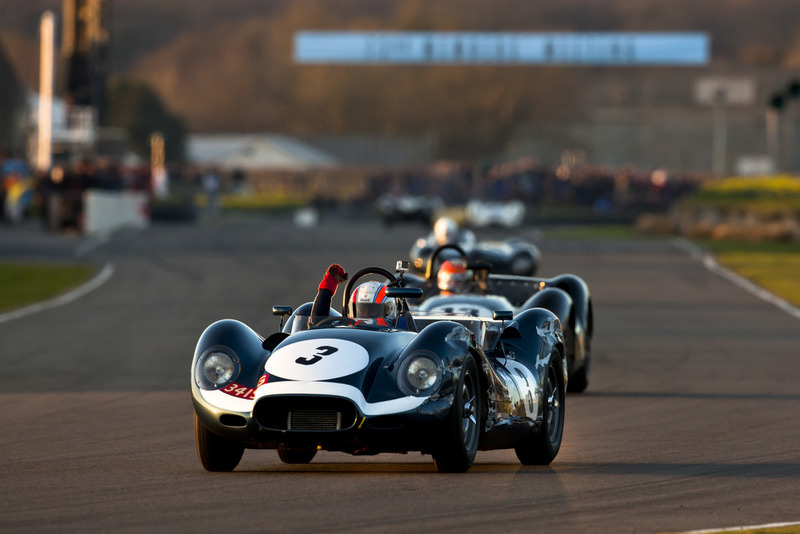 The Goodwood Revival Meeting takes place on 12-14th September 2014.